Lovingly renovated country house with garden close to the village of Torria, with stunning, unobstructed view over the Maritime Alps. The natural stone house is detached and surrounded by garden on two sides. Over the past two years, the house has been lovingly renovated and divided into two independent flats. The larger of the two measures 140 sq.m., split over ground and first floor with both floor levels connected by both an internal and an external staircase. A 50 sq.m. living area forms the focal point of the ground floor. The very high ceilings made it possible to create a 18 sq.m. gallery space, perfect for use as a bedroom to sleep 2-3 people. A beautifully tiled stove keeps the room comfortably warm and a shower room decorated with attractive tiling, rounds up this floor level. The bedroom is located 2 steps up from the living area. On the first floor is a 55 sq.m. fully fitted eat-in kitchen and a 30 sq.m. south facing terrace. Adjacent to the kitchen is a guest bathroom, accessible from the exterior. Both floor levels open out to the surrounding 250 sq.m. garden, planted with olive trees, oleander, citrus fruit trees and fragrant Mediterranean herbs. The house benefits from central heating fed by communal gas, satellite TV, telephone and internet. On the lower ground floor is a small apartment measuring 60 sq.m., split into eat-in kitchen, 2 bedrooms and one bathroom. This unit also has access to the 250 sq.m. garden. A pleasant 40 sq.m. cellar with vaulted ceilings lies at street level and would be perfect for use as garage, workshop or studio. 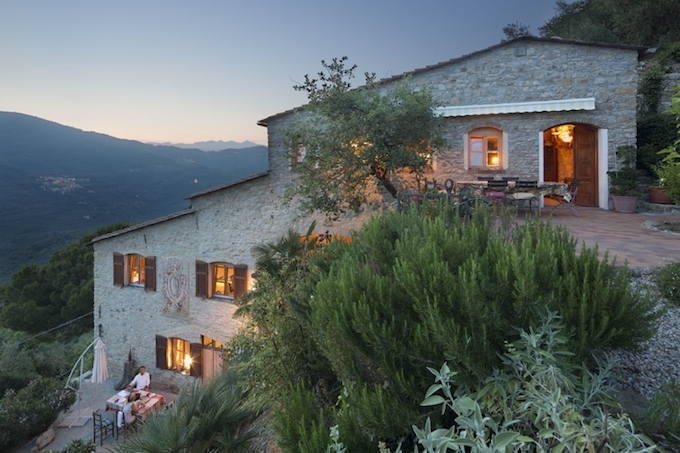 Occupying a wonderfully sunny spot with breathtaking, unobstructed views over the Maritime Alps, this property is situated on the outskirts of the small village of Torria, a 24 minutes drive into the hinterland of Imperia-Oneglia. The village has three restaurants, one bar and a food shop. The large shopping center of Pontedassio is only 15 minutes away and nearby Imperia has of course a large selection of excellent shops on offer. Ballets de Monte-Carlo presents L’été DANSE!